Content planning is something that often gets overlooked by bloggers. However, it is a serious and important part of the blogging process. Let's face it - some of us are the spontaneous type. You may feel like having a schedule will tie you down to that specific blog post you scheduled, or that your ideas have to be limited. This doesn't always have to be the case though. You can always have a space for alternative ideas, and use sticky notes to easily move your ideas around. If a better idea comes up, make a list of ideas that are all in one place. Just because you plan your posts doesn't mean you have to sacrifice being spontaneous. Maybe you have no idea where to start with content planning. That's totally cool! I like to start with a yearly overview. This helps me so that I can see and plan for all future events and holidays. Then a monthly editorial calendar that helps me schedule in my blog posts and social media posts. A weekly view helps for day to day tasks , and of course you can't forget all the places for lists. 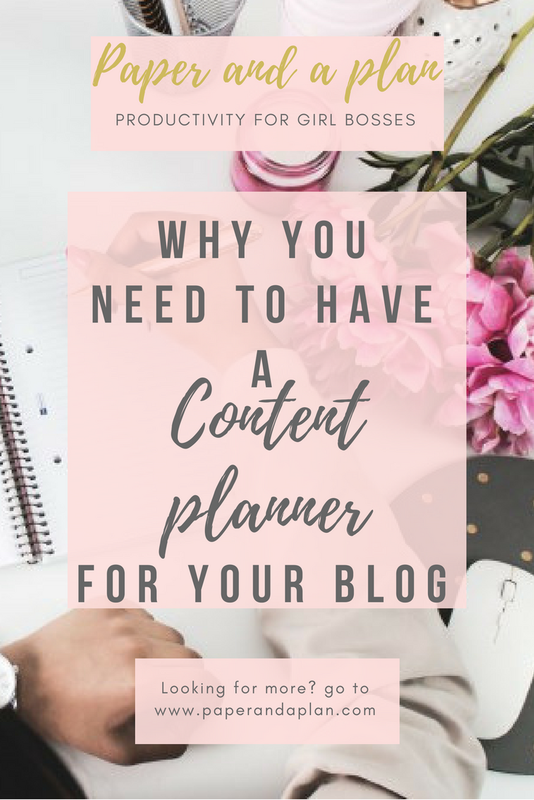 Having a separate planner for your blog content may seem a little tedious and hard fo keep up on, but the organizational factor it brings is phenomenal. No more throwing your ideas in "the notebook" where you house all your other random thoughts and braindumps. I also find I need way more space to plan out specific details of my blog. Without a separate planner, my main planner gets cluttered quick. So how do you even go about finding a content planner ? Well you're in luck because I made my content planner completely free for digital download. It comes complete with braindump pages, a yearly overview, monthly editorial calendar, weekly overview, & blog post checklist. This is the planner I use to plan my content like a pro. You have to try it yourself, so click HERE to go get your free copy. If you decide to use it and love it be sure to use #productivitybabes so I can feature you on my instagram!